Every fall season, I get so excited to wear all one of my favorite looks: the belted poncho scarf. This outfit looks incredibly chic, it’s so warm, and it’s a no brainier to style. All you need are the essentials: a poncho, a belt, and some comfy leggings. I bought this Uniqlo poncho while I was in NYC for NYFW. It was only $29 and it comes in a few other colors. For the price point, it is very nice quality and it is the perfect piece to layer your favorite long sleeve or turtle neck under. The best part about this poncho is that you can style it as such, or wear it like a blanket scarf! The clothing tag came with little instructions so it’s meant to be worn multiple ways. Don’t you just love versatile pieces like this? I styled this poncho scarf with a pair of my favorite boots. Whenever I wear these boots I feel like such a star. The Italian leather and the 5 inch heels really make them a unique pair! I’ll admit, they are a little hard to walk in, but they are incredibly fierce so WHO CARES! I think I’ll file that one under #fashionbloggerproblems. To add a pop of color, I accessorized my look with a structured bag with a mustard-colored pompom on it. I think that pop of yellow really brought the outfit together. Topping the look off, I wore my favorite black hat and my new obsession: Meet Matte Hughes Lip Stain in Dedicated. 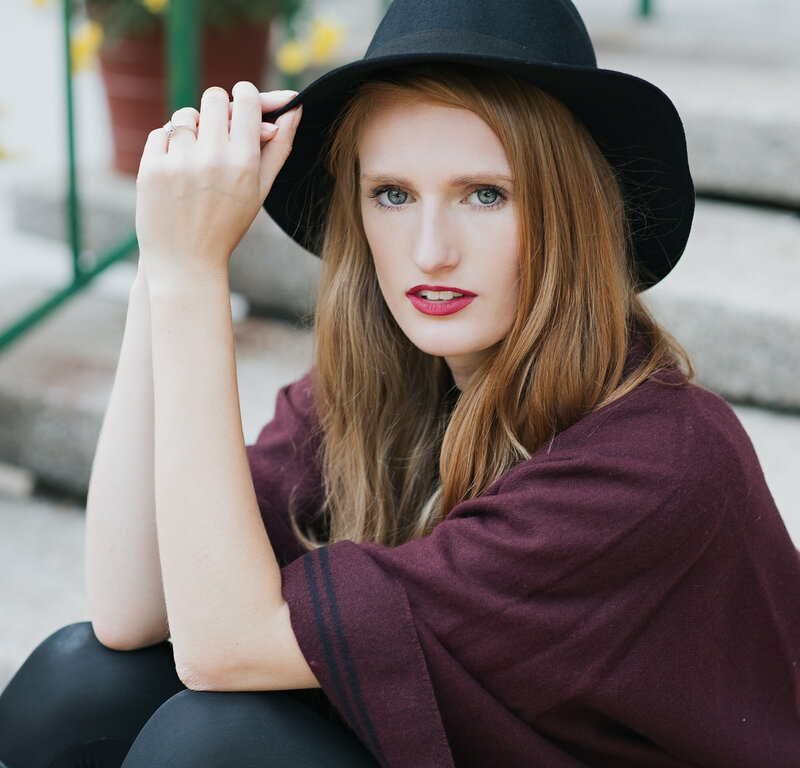 I love this dark color lip for fall and this stain lasts forever! The formula is creamy and soft and smells like peppermint. It’s been my go-to for shoots lately! 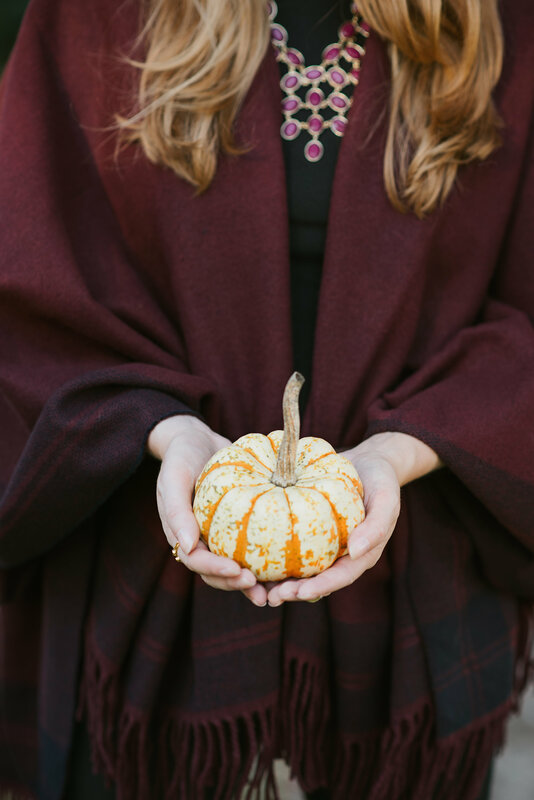 Tell me in the comments below, what are some of your favorites items for fall? I love how you belted it. Such a pretty color poncho! And those boots are so adorable too. I’d love a pair like that! I love how you styled this poncho! I have too weird of a body to ever wear belts like that, but you look FAB! I’m sure you would look amazing in this style! You are always so on point!! I have never tried to belt my poncho!! You killed this look! Love the details of the hat and the pom pom!! It makes such a chic outfit, and you can also do it with scarves too. This piece just happens to be a both a poncho and a scarf! This poncho is so cute and it looks so warm! Love how you styled it. Also love your boots! This color on you? AMAZING! You look gorgeous, as always! I LOVE the way you styled this and I think I need that poncho! I think you do too! It’s such a great piece. Love that belted poncho and how it matches your bag. ADORE this look!! I have a couple of ponchos but hadn’t considered belting it until, at a Pop Up Shop for a designer, she suggested it. DUH, best thing ever!! You look GORGEOUS as always and I love the pop of color from the pom pom!! I always look forward to your posts! You have great style! Love this combo! I love this poncho! It looks so chic and cozy! I especially love the fridnge detail and those leggings, they look so comfortable and chic at the same time. Thanks so much Greta! Normally I’m not a huge fan of leggings for pants, but with the poncho it covers everything and like you said it looks so chic! Wow! Such a chic look! Loving how you accessorized with a pop of yellow and also loving your hat! My favorite item in the Fall are scarves and boots! Scarves are everything!! So warm and when it gets colder a necessity!! I absolutely love these oxblood color! It is gorgeous on you! and that bag!! This look is SO insanely beautiful. LOOOOOVE the colors of it. Thanks so much! I love a good structured bag and this one was only $30! Such an adorable fall look – love how you belted the poncho! That poncho is such a beautiful color on you! You have the most amazing style! Absolutely love this outfit! I love the way you have styled this poncho! Such a cute look! Love your poncho! That color is gorgeous! this is such a gorgeous outfit, i love the color of that poncho and you styled it perfectly with the hat! Thanks so much Mary! This hat is my new obsession. 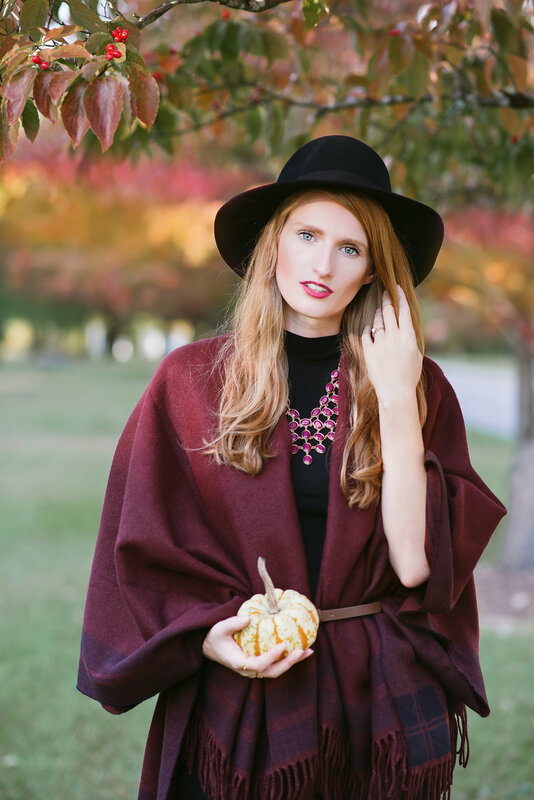 You have gorgeous fall style! 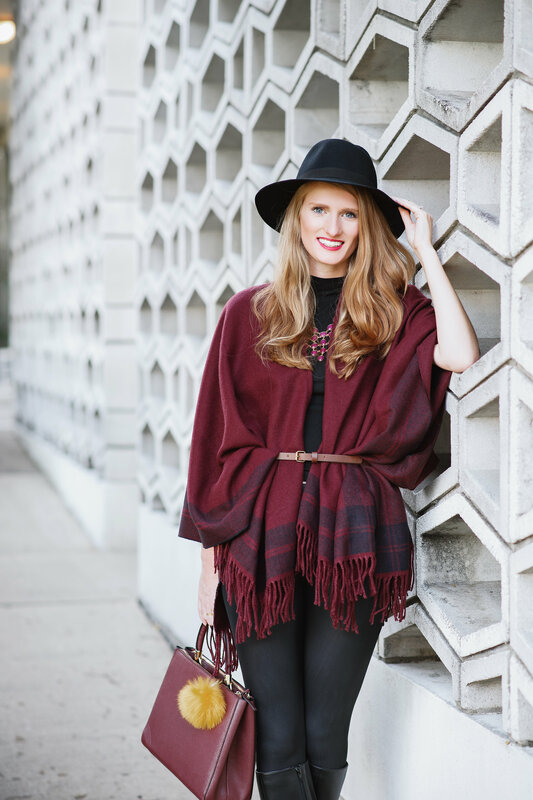 This poncho look amazing on you and is perfectly paired with that hat! It’s such a cozy look, one of my favorites this season!